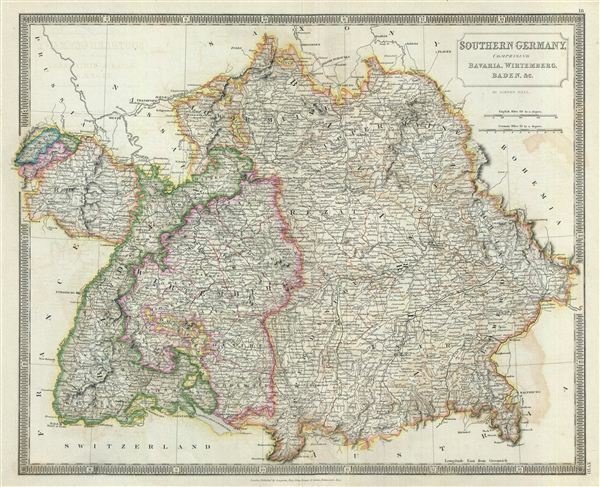 Southern Germany, comprising Bavaria, Wirtemberg, Baden, &c.
This is a beautiful map of southern Germany from Sidney Hall's extremely scarce 1835 New General Atlas. It covers Germany south of the River Main (Mayne or Maine) as far as Hornberg, depicting the semi-autonomous kingdoms, duchies, and Prussian territories in southern Germany. These include Bavaria, Baden, Rhine, and Wurttemberg (Wirtemberg). Towns, rivers, mountains, railroads, and various other important topographical details are noted. Elevation throughout is rendered by hachure and political and territorial boundaries are outlined in color. With the abolition of the Holy Roman Empire in 1806, Bavaria became the Kingdom of Bavaria. Its territories were doubled and it became the second largest Kingdom after the Kingdom of Prussia. The Congress of Vienna in 1815 created The German Confederation to coordinate the economies of these separate but culturally related German-speaking countries. The Confederation acted as a buffer zone between Austria and Prussia, the two largest and most powerful member states. It briefly dissolved during the Revolution of 1948, but was re-established in 1850. Nonetheless the rivalry between the two powerful states increased until it finally broke out into the Austro-Prussian War. Prussia won the Austro-Prussian War in 1866 which ultimately led to the collapse of the German Confederation. A few years later, in 1871, most of the former Confederation states were folded into the newly proclaimed German Empire. Rumsey 4224.018 (1830 edition). Philips (Atlases) 758. Ristow, W., American Maps and Mapmakers: Commercial Cartography in the Nineteenth Century, p. 303-09.